This is a beautifully painted model. The most famous British period ship The HMS Victory was laid down on 23 July 1759 and launched on 7th May 1765 at Chatham Dockyard (Kent). HMS Victory was launched in 1765 at Chatham Dockyard and was commissioned in 1778. She was the fifth ship to be bear that name. The battle honours include: Armada (1588), Dover (1652), Portland (1653), Gabbard (1653), Scheveningen (1653), Four Days Battle (1666), Orfordness (1666), Sole Bay (1672), Schooneveld (1673), Texel (1673), Barfleur (1692), Ushant (1781), St. Vincent (1797), Trafalgar (1805). She became famous when in October 1805, she served under Vice-Admiral Lord Horatio Nelson during the battle of Trafalgar. She carried 104 guns at Trafalgar and was manned by a crew of 821 ready for battle and sworn to defend King and Country at any cost. The gunners could fire and reload all guns within 90 seconds and fired solid rounds that could penetrate 3 feet of oak causing high casualty numbers due to wooden splinters. In 1805, Napoleon ordered Admiral Pierre de Villeneuve to unite with other French ships at Cartagena in the Mediterranean. However, Villeneuve was aware that a fleet of 29 British ships of the line was in the area and that the Franco-Spanish fleet would suffer losses if battle ensued. Napoleon accused Villeneuve of cowardice so on October 20th the French admiral set sail from Cadiz. Nelson’s fleet effectively prevented the Franco-Spanish fleet from entering the Mediterranean Sea and forced them into battle off Cape Trafalgar in southwest Spain on 21 October. Villeneuve had more warships than Nelson (33 to Nelson's 29) and was confident this would give him victory. He ordered his fleet to sail north in a single, irregular line. Nelson (in a prearranged plan) split his fleet into two squadrons and attacked the centre of the Franco-Spanish line at right angles. The problem with attacking head-on was that the Franco-Spanish ships would be able to maintain a raking broadside fire on the bows of the leading British ships, to which the British ships would be vulnerable. Nelson was aware that French and Spanish gunners were ill-trained, and would have difficulty firing accurately on a moving ship. Nelson's plan was indeed a gamble, but a carefully calculated one. The HMS Victory will be forever linked with the famous message sent from Lord Nelson to the rest of the fleet before the battle: " England Expects that Every Man will do his Duty". She then spearheaded and engaged the combined Franco-Spanish fleet. She engaged the Redoutable and fired double loaded rounds at close range causing total utter mayhem on the French vessel. From then on all hell broke loose. The crew on the Victory boarded the Redoutable and the battle lasted long. Wearing his full uniform and pacing the quarter-deck, Lord Nelson's intention was to lead proud Englishmen to Victory. However, this highly visible display became the target of a French sniper posted on the mizzen of the Redoutable. Nelson was shot in the upper shoulder and taken down to the orlop deck for the attention of Dr. Beatty the ship's surgeon. Nelson received news of complete Victory over the Franco-Spanish fleet just before his death. The importance of this ship in military history is not only that she led the charge against the combined Spanish and French fleets but mainly due to the events that took place on the ship culminating to one of the most significant Naval Victory in History and the death of Lord Nelson. In 1812 the Victory was retired from frontline duty and anchored in Portsmouth Harbour, on the south coast of England. For the next 110 years, the Victory remained at her moorings in Portsmouth Harbour fulfilling a combination of practical and ceremonial roles. In 1922, amid fears for her continued survival, the Victory was moved into Portsmouth's Royal Naval Dockyard and placed in No2 Dry Dock. Work then began on restoring the Victory to her 'fighting' 1805 condition and continues today. 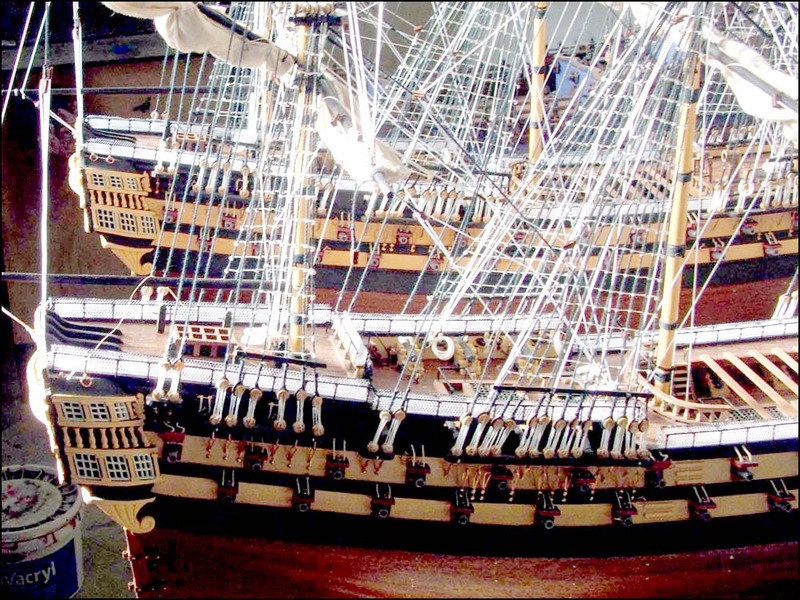 Learn more about the history of the HMS Victory by visiting the Royal Navy website. "The Victory has arrived – it is just beautiful and exactly what I'd hoped for! Thank you!!! The courier says you are the best packagers in the business - I agree with him! You also make brilliant models!" "The model arrived 1.00pm today. Absolutely delighted." "Hi, just to let you know that I am in Scarborough today and the model has arrived. So well packed it took us a little while to unpack, but it is just what was wanted." "The model of HMS Victory 60 cm painted has arrived today in perfect condition. It is very nice and makes me great pleasure. Thank you very much for your kind cooperation!" "I want to thank everyone involved at Admiralty Ship Models. It's stunning." "I received the Victory model this morning. Stunning! I love it. Well packed – you're not kidding!"